Should surgery be performed immediately, or is it better to first administer antibiotics and then perform surgery? A study led by Heidelberg University Hospital Department of Surgery has demonstrated that patients suffering from acute cholecystitis should be operated on immediately. There are no advantages to delaying surgery until antibiotic therapy has been administered for several weeks. After undergoing surgery performed within 24 hours of diagnosis, the patients have fewer complications, are back on their feet earlier, and can leave the hospital more quickly. “With this study, we were finally able to present scientific evidence that allows us to resolve years of controversy,” explained Prof. Markus W. Büchler, Director of Heidelberg University Hospital’s Department of Surgery. The results of the ACDC study (“Acute cholecystitis – early laparoscopic surgery versus antibiotic therapy and delayed elective cholecystectomy”) have now been published in the U.S. journal Annals of Surgery. The major risk factors for acute inflammation of the gallbladder (cholecystitis) are gallstones and increasing age. If left untreated, the gallbladder can rupture, leading to severe infections in the adjacent organs and in the abdominal cavity. Today, the gallbladder is usually removed laparoscopically without requiring a large abdominal incision. However, previously there was no consensus on the optimal timing for the procedure. The ACDC study was jointly conducted by surgeons and internists at several centers in Germany. It is the first clinical study to prospectively investigate the two treatment approaches – early and delayed surgery – and involved two large groups composed of approximately 300 patients each who were randomly assigned to the groups. 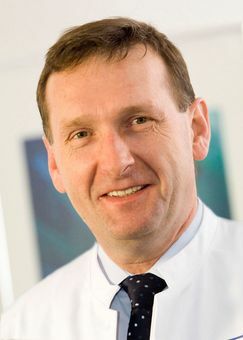 The Heidelberg General, Visceral and Transplantation Surgery has an outstanding reputation worldwide – thanks to its excellence in abdominal surgery and transplantation. Every year, around 5.000 patients are treated on an inpatient basis, with around 50.000 undergoing outpatient treatment. The interdisciplinary team performs over 8.000 visceral surgical procedures annually, 1.100 of which involve the gallbladder.